Today I have the other Mother's Day card I made. This one I made for my mother-in-law who happens to love pink. Strawberry Slush card stock 5-1/2" x 8-1/2", scored at 4-1/4"
Whisper White card stock 3-1/4" x 3"
Basic Black card stock 3-1/2" x 3-1/4"
Pink Pirouette Taffeta Ribbon 21"
I started off by folding the Strawberry Slush card stock on the score line and stamping the card front with the Positively Chevron background stamp in Strawberry Slush ink. Then I took the Pink Pirouette ribbon and wrapped it around the card front and tied it into a bow. 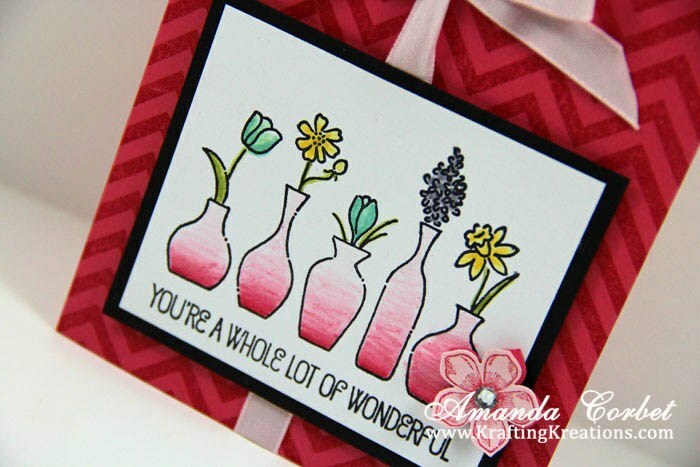 Next I stamped the Vivid Vases image onto the Whisper White card stock in Stazon ink. I used the markers to color in the flowers. For the vases I squeezed the center of the closed Strawberry Slush ink pad, then opened it up half-way, and used a Blender Pen to pick up some of the color to apply to the vases starting from the bottom and working my way up. That gives the vases the lovely ombre look. 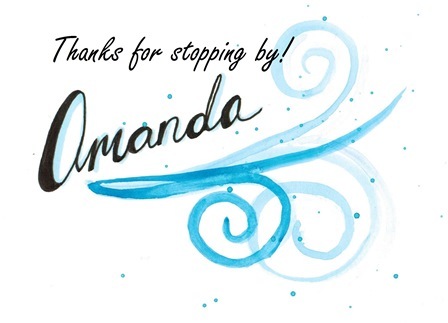 This layer was glued onto the Basic Black card stock and then this panel was stuck onto the card front with a few Stampin' Dimensionals. 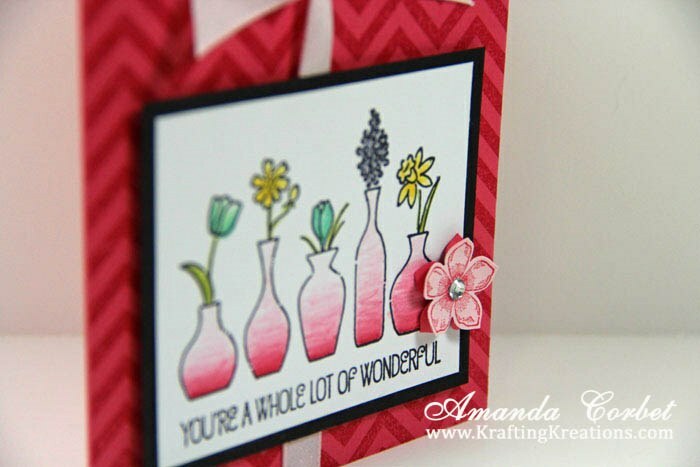 I wanted to add just a little more to this card so I stamped a flower from Petite Petals onto a scrap of Pink Pirouette card stock in Strawberry Slush ink. I punched out the stamped flower as well as an additional flower from Strawberry Slush card stock with the Petitie Petals punch. 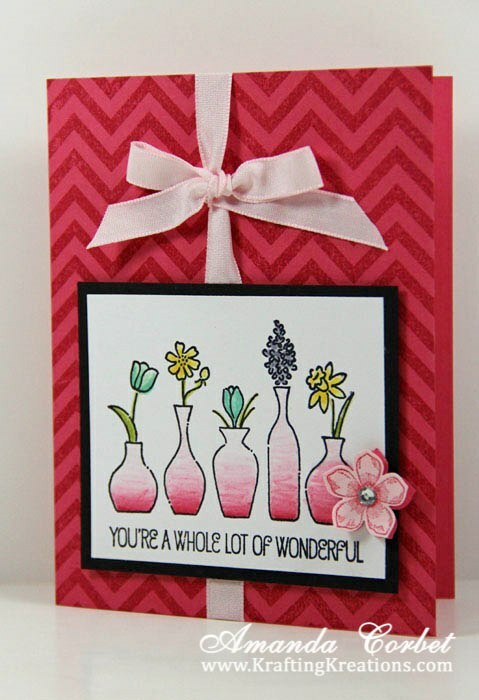 I glued the flowers together with some 2-Way Glue Pen then stuck it onto the card front with a Stampin' Dimensional. Finally, to add a little sparkle, I added a Rhinestone into the center of the flower.